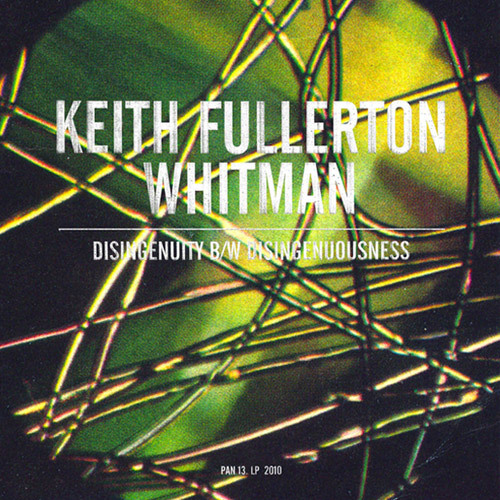 If you want to set yourself a challenge as a music reviewer, try finding words to describe a Keith Fullerton Whitman record. Over the years I have managed to create a way of writing about Merzbow but noise/experimental artists like Keith Fullerton Whitman are really tough. One of the things I promised myself I wouldn’t do when I started this blog was to reference the obscure with the more obscure. If I wanted to go down that path then I could tell you that this record sounds like John Wiese and Russell Haswell recording each other in the hull of a disused oil tanker but that would be cheating. If you are familiar with noise then in the words of Dylan Nyoukis will make sense – this is a record of noises, not noise. There is no layered wall of sound. The layers have been stripped back, the noise compartmentalised, and then strung together to create an, at times, hyper-kinetic library of experimental sound that bounces around in a an expansive, echoing acoustic space. There are compelling reasons why this record turned up on so many people’s Best of 2010 lists. Challenging, fun and mesmerizing. An excellent record. This entry was posted on February 27, 2011 at 12:24 am and is filed under Music, noise with tags Keith Fullerton Whitman, Music, noise. You can follow any responses to this entry through the RSS 2.0 feed. You can leave a response, or trackback from your own site. Based on the KFW records I have, I would never associate his output with noise … well maybe his Tonschacht 7″ could vaguely be classified as noise. The idea of looking at his music from a noise point of view is very refreshing. Thanks.